It's too bad we almost see nothing of what is written on your paper...I'd love to try an «apple coffee cake» recipe; It «sounds» delicious! 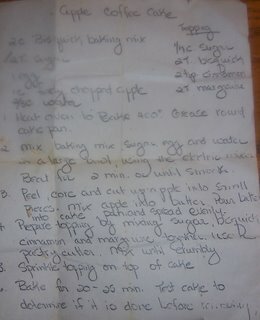 I did a search for this after telling my child about my memories of 6th grade home ec class, making this very coffee cake!!! Can you please post a larger photo or type out the recipe? I can't believe I actually found this. Thank you!